This post may contain affiliate links for your convenience. Thank you for helping support our family! We are going in birth order, so Abby is next up for her interview! I sat down at dinner and told her that it was time to answer her birthday questions. She gave me a big grin and said, "BIRTHDAY CAKE!!!" Unfortunately, I didn't get much more than that from here. 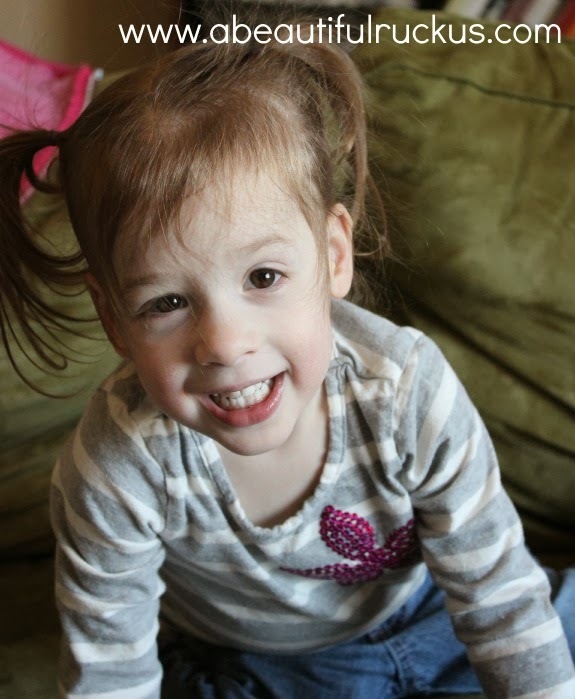 She has a 23 month speech level, and easily half of her vocabulary are words for her favorite foods. She's so funny! So like I did for Caleb, I'm going to fill in her answers for her this year. Definitely crossing my fingers that she has enough words to answer for herself next year! How old are you? "Are you two? *big grin* Abby, are you two? Will you be three next week?" What makes you happy? "CAKE!" <---the only answer I got out of her. Lol! What is your least favorite thing to eat? I don't like anything mixed together. What do you and your mom do together? I don't like waking up in the morning or from my nap, so Mommy lets me sit with her for awhile while I adjust. She also lets me sit and "help" her with her writing. What is your favorite book? I don't really read very much. There is too much to sing about instead! What do you want to be when you grow up? Mommy says that I might be a singer like my Grandpa and Cita. Daddy says I might be a contortionist. But I just want to be allowed to sleep on my own terms. 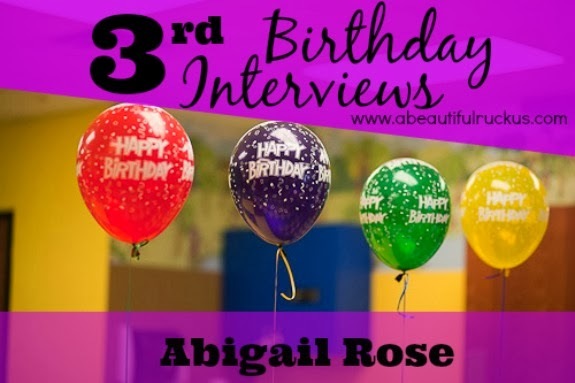 If you want to jump back, you can read Abby's 2nd Birthday Interview here. And don't forget to read Caleb's 3rd birthday interview from earlier this week! This post may contain affiliate links. For more info, please see my disclaimer page. Maybe she'll be a chef or waitress since she seems to really like food!